1-1/4pounds raw 16-20 count tail-on peeled and deveined shrimp, thawed if necessary. 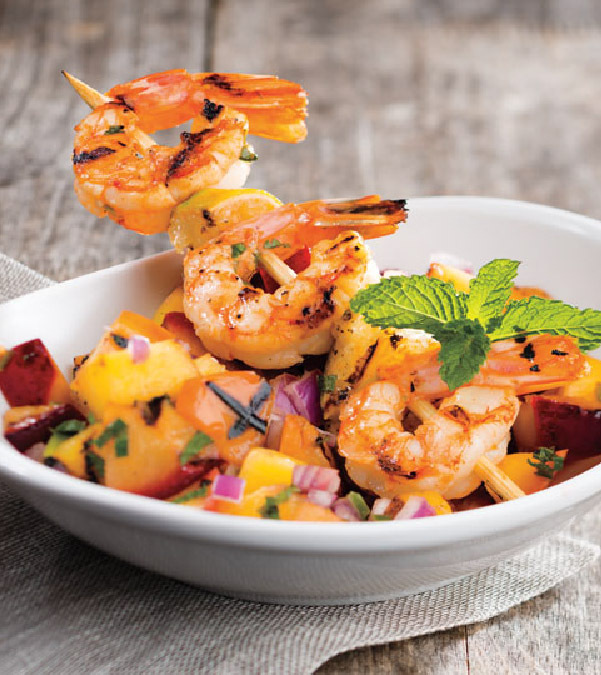 1.Prepare Shrimp Skewers: Prepare outdoor grill for direct grilling over medium heat. In small bowl, whisk garlic, juice, tequila, cilantro and sugar; whisking constantly, slowly drizzle in oil. 2.Place shrimp in large zip-top plastic bag; pour tequila mixture over shrimp. Seal bag, pressing out excess air; let stand 20 minutes. Soak skewers in water 20 minutes. 3.Prepare Salsa: Brush fruit with oil. Place fruit cut side down on hot grill rack; cover and cook 8 minutes or until tender and grill marks appear, turning once. Cut fruit into 1/2-inch pieces. In medium bowl, whisk agave nectar, juice, tequila and salt; add onion, mint, jalapeño and fruit and toss until well combined. 4.Remove shrimp from marinade; discard marinade. Alternately thread shrimp and lime wedges onto skewers; place skewers on hot grill rack. Cook, covered, 5 minutes or until shrimp turn opaque throughout, turning once.